The 21st-century customers expect companies to know them inside out to cater to their requirements and preferences. Thus, at the present times, businesses are taking all possible measures for exceeding customer experience. In order to know your customers’ needs, you need to achieve a comprehensive view of your customers’ journey; this is no doubt, a challenging task in a world of multichannel marketing. Thanks to technological advancements for introducing innovative opportunities to digital marketers to help them revolutionize their marketing tactics by employing smart strategies for connecting with their customers in a superior way. Cognitive Tools Can Help Marketers Strengthen Customer Relations Besides Driving Strategic Growth: We have entered the cognitive era which embraces data in extraordinary ways for intensifying customer relations besides driving strategic growth. In the cognitive era, marketing involves the utilisation of technology and insight in innovative ways for enhancing customer experience and building relationships with customers that can endure the evolving dynamics and demands of an ever-changing marketplace. Marketing in the cognitive era is all about creating distinctive yet unified moments all the way through the consumer’s journey that are customized to their needs. Cognitive insight helps you to reach out to your targeted audiences by employing real-time personalization tools for providing your audiences with the right content. Moreover, it can help you significantly in driving strategic growth. The greatest advantage of cognitive technologies is that data generated from structured as well as unstructured sources can be linked as well as analysed for generating exceptional insights pertaining to tone, emotion and attitude that can strengthen the bond between you and your buyers. Cognitive tools also help you appraise the performance of your digital campaign which in turn helps you evaluate the possible impact of modifying the rules of content along with program logic for driving more effectual results. Engagement Strategy Replacing Mobile Strategy For Keeping Customers Engaged on Mobile Devices: Currently, companies are shifting their focus from mobile strategy towards ‘engagement strategy’. Since mobile devices are crucial tools that facilitate customer experience, you should definitely consider how your customers experience your brand on their mobile device; however, this is not the only factor you should emphasize on. Equal attention should be paid to interactions happening in other channels. Presently, companies are making it a priority to assimilate their processes, teams and technologies so as to incorporate the actions taken by their customers into their internal systems such as marketing automation and CRM. More and more marketers will provide influencers with adequate resources and also connect them with subject-matter experts so as to enable influencers to comprehend the key principles behind the organization’s vision. Marketers will refrain from controlling the message and let influencers speak about their brand’s values in a genuine way that resonates with their audiences. If your influencer has a strong understanding of the message you intend to convey, it is advisable to let your influencer speak about your brand’s values in a genuine way that resonates with your target audiences. In order to evaluate the impact of influencers on the overall success of their business, savvy marketers will make use of more sophisticated analytics and metrics such as number of clicks they drive to their website along with the number of sales generated as a result of the clicks. These guidelines will go a long way in helping you broaden the reach of your brand this year, besides bringing new customers. Marketing Combined With Ad Technologies Will Drive Efficiency and Enhance Customer Experience: Digital marketers will be using email and website personalization in sophisticated manners to improve the possibility of conversion and enhance customer loyalty. Integrating marketing database to the demand-side platform can facilitate more efficient spend as you can save the expenditure of sending product ads to customers who already own them. When integrated with marketing data, ads can drive sales by maximizing purchases besides tapping into customer communities and loyalty programs. Besides this, cognitive technologies will help you discover your potential customers in your database and target lookalike audiences who are similar to customers you care about so that you can drive conversion for people who are more likely to engage with your brand. Focus Will be on Customer Success and Customer Retention Tactics: Reputed companies have come to realise that enhancing customer success can boost retention besides providing a steady basis for organisational longevity. Thus, companies are now focusing on “Customer Success” organizations and forming customer-focused marketing strategies by leveraging new platforms and cognitive tools for amplifying customer lifetime value. In order to improve customers’ call centre experience, leading companies are amalgamating their call centre data with marketing automation. Simultaneously, forward-thinking organizations are amalgamating more data pertaining to product usage in their marketing automation platform. Another strategy involves recording mobile app behaviour or geo-location sensors for integrating the data with marketing automation practices. This will help in personalizing data in a more advanced way to build solid relationships besides facilitating customer success. 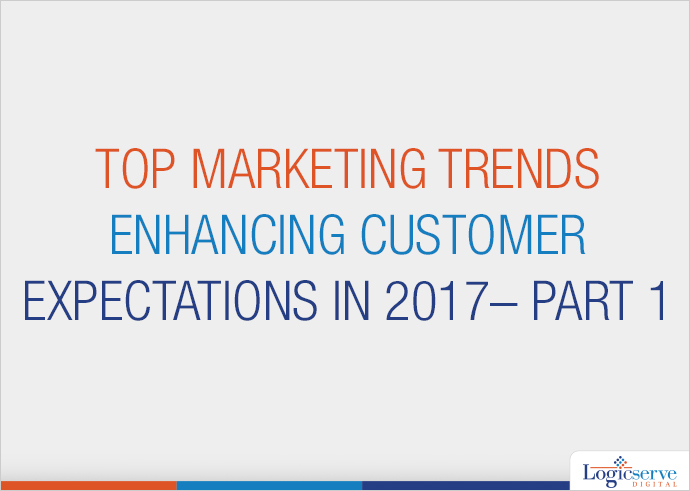 These are some of the trends shared by IBM that will help marketers exceed customer expectations this year. In our next post, we’ll share few more trends that will help you drive multiple initiatives for strengthening customer connections and drive business growth, besides exploring innovative business opportunities.